guardiola has much to lament, but that doesn’t mean his days are numbered. It’s not been a good week for Bayern Munich manager Pep Guardiola. After suffering a humiliating loss at home to Real Madrid in the second leg of the Champions League semifinal — the 4-0 scoreline also being his heaviest ever defeat — and losing close friend and fellow former Barcelona boss Tito Villanova to complications from throat cancer, it’s safe to say that he’s ready to put this week in his past. But the world’s (now formerly?) most admired manager has received no respite for his troubles, as he’s been run through the ringer by media and fans alike for his tactical approach in both legs of the semifinals. A direct descendant of the Cruyff school of possession-based football preached at Barça, Guardiola has long been known as a man with a single philosophy. Defiantly so, even. And his use of the approach during the 5-0 aggregate scorching by the Spaniards in Europe, plus a series of defeats in the Bundesliga, has caused quite a few to question the worth of the tactic in today’s game. This despite being generally viewed as favorites ahead of their tie with Madrid, and many proclaiming them to be best side in the world over the last few months. For some crashing out before the final hurdle seemed to have been the last straw for some. Let’s be honest though: Guardiola’s record should speak for itself. Pep’s list of accomplishments is long and his sides’ achievements and dominance has been, at times, unbelievable. Bayern’s record early capture of the Bundesliga title this year should be enough on its own, so I won’t bother to list all of the trophies he’s managed to tally up in a relatively short managerial career. And let’s also not forget that Bayern are still a great club. They still won the Champions League last year in impressive fashion, a feat that shouldn’t be diluted because they didn’t repeat again this season. Remember that there has never been a club that’s defended their Champions League title. And their barnstorming performances earlier this season are a sign that a Guardiola-led Munich are more than capable of producing further glory for the Bavarians. 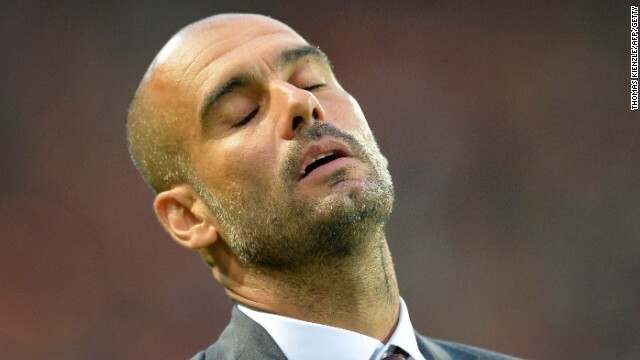 But if we’re going to levy some criticism at him, at most, Pep is guilty of lacking a solid “Plan B” for when his prototypical style fails him. This isn’t a new complaint, by the way. His failures at Barcelona were often rooted in similar faults. Barcelona’s appointment of Gerardo Martino as manager for this season — although not quite as successful as they would have hoped — was a direct indictment of this, as the Argentinian comes from a much more direct school of coaching. Previously, Pep had attempted to provide a similar solution in signing Zlatan Ibrahimovic a few years back, but after that failed, he’s never attempted to go that route again. Instead, Guardiola has maintained his possession-centric set up and relied upon small yet steady evolutions in his teams’ shapes and squad selections. That, and he’s had a tendancy to rely upon incredibly talented players to help fill in the gaps. So, the death of tiki-taka and possession? It’s been greatly exaggerated, in my humble opinion at least. And the set backs of Guardiola’s current team — not to mention the fading aura of his former side — just means that the rest of the world has evolved to find a way to beat the possession game. And as a result, Guardiola and his sphere just need to learn their lessons and adapt themselves. Next Post: win a free spurs track jacket from campo retro! Bad week for Pep, bad season for Barca.